PACKET PICKUP: Runner's packets with BIB's, T-shirts, Chips and instructions should be picked up at The Three Sons in Milford, Iowa from 10:00 AM to 7:00 PM on Friday before the race. COURSE: The course will be marked by spray paint on the blacktop surface. Contestants must register, wear assigned chip, and participant numbers visible to race officials during entire event and crossing finish line to be eligble for awards. 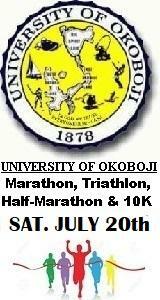 Marathon, Triathlon, Half Marathon, and 10K course maps are available below. Triathlon will start in waves. All events end at the State Pier on the waterfront at Arnold's Park. Shuttle bus provided back to starting points after the races. Discounts available for early registrantion. Online registration is strongly encouraged. CHAMPION CHIP TIMING: Participants will be responsible to verify proper BIB assignement, chip assignment and registration data prior to race day. Participants will be responsible to return chip and velcro strap at the end of the event within the provided bins. Participants will be subject to $35 fee for any missing chips. NO RACE DAY REGISTRATION WILL BE ALLOWED. NO REGISTRATION ON FRIDAY OR SATURDAY. PACKET PICKUP ON FRIDAY IS STRONGLY ENCOURAGED BECAUSE VERY LIMITED TIME WILL BE AVAILABLE FOR PACKET PICKUP ON SAT MORNING. BIBs MUST BE WORN AND VISIBLE DURING ALL PHASES OF EVENT. QUESTIONS PLEASE CLICK ON THE CONTACT EVENT ICON ABOVE TO SEND AN EMAIL DIRECTLY TO THE EVENT COORDINATOR! or call and leave message 712-330-4343. TRIATHLON NOTES: Participants must wear helmet and assigned swim cap. Helmet numbers must be visible from front. Bike numbers must be visible from side. Chest numbers must be visible from front. Bodymarking for swim on both arms and legs visible from side. If wearing wetsuit put participant number on swim cap sides. Course map will be on the back of your BIB. Assigned Chip MUST be on ankle using a velcro strap during all phases of the event. ALL TRIATHLETES MUST RETURN CHIP AND STRAP AT FINISH LINE. Triathlete will be charged $15 for an un-returned chip. This is NOT a USAT sanctioned event. We are here to have a good time and enjoy the beautiful area. Please be at Arnolds Park Amusement Park transition area, setup and numbers on ready to go, no later than 6:30AM instructions start at 6:45AM. TRANSITION AREA (set-up) CLOSES 6:40AM. Triathletes will need to be set-up and ready by this time. You will not be allowed back into the Transition area after it is closed. SWIM: 0.6 Mile out and back swim, starting from water at Arnolds Park Amusement Park. Please mark arms and legs with participant numbers using a black marker. Chip MUST be on ankle using a velcro strap during all phases of the event. There will be multiple wave water start. TRANSITION ONE (T1) - SWIM TO BIKE: Bikes must be racked in the transition area. Enter the transition area from the beach after the swim. Swim time will end when crossing mat after swim. T1 starts when crossing SWIM IN mat after swim and T1 ends when crossing BIKE OUT mat with bike. Run bike over the BIKE OUT timing mats prior to mounting your bike. You are not allowed to ride your bike in the transition area. BIKE: 18 Miles ride around West Lake Okoboji returning to Arnolds Park Amusement Park. Place bike number over the cross bar of your bike so that it is visible by event officials on either side of your bike. Place helmet number on the front of your helmet so that it is visible by event officials. The roads are not closed so watch for vehicles on the road. For your own safety, bike helmets are required to participate in this event. TRANSITION TWO (T2) - BIKE TO RUN: Bike time ends when crossing BIKE IN mat. Your T2 time starts at this time. Dismount bike prior to entering the transition area and run your bike to your individual area. Place participant number (Race BIB) on front of shirt or put on race number belt. You must have your race bib on, facing forward, during the run. RUN: 4.5 Mile run from transition area out and back to the finish at State Pier in Arnold's Park Amusement Park. T2 time ends and Run begins when crossing the RUN OUT timing mats. When finishing make sure the back up timers see your BIB number when crossing the finish line. Return your chip/strap at the end of the finish chute. Marathon: 26 miles, 385 yards and Course Closes @ 11:30AM. EARLY START: All participants that have an estimated finish time of 5 hrs or more must specify early start during registration. Early start will be at 5:00AM same location. ANYONE DOING THE EARLY START MUST CHECK IN WITH ALLSPORTCENTRAL STAFF AT START LINE PRIOR TO BEGINNING. Half-Marathon: 13.1 miles and Course Closes @ 11:30AM. 6.2 miles Starts at Methodist Campgrounds. Course Closes @ 11:30AM. TEAM CAPTAINS: Must register entire team during registration by first registering as a captain then clicking on the proper link on the receipt page to enter remaining team members. If you need to add or edit team member information after you have registered as the team captain, simply login with the AllSportCentral Athlete account that you used when registering and select MANAGE TEAM ROSTER icon from your Athlete home page to update your team roster. UPDATED TRIATHLON NOTES: Participants must wear helmet and assigned swim cap. Helmet numbers must be visible from front. Bike numbers must be visible from side. Chest numbers must be visible from front. Body marking for swim on both arms and legs visible from side. If wearing wetsuit put participant number on swim cap sides. Course map will be on the back of your BIB. Assigned Chip MUST be on ankle using a velcro strap during all phases of the event. We are here to have a good time and enjoy the beautiful area. Please be at Arnolds Park Amusement Park transition area, setup and numbers on ready to go, no later than 6:30AM instructions start at 6:45AM. TRANSITION AREA (set-up) CLOSES 6:40AM. Triathletes will need to be set-up and ready by this time. You will not be allowed back into the Transition area after it is closed. Non-participants are not allowed in transition area. Participants must run or walk bike through the transition area. Those riding bikes will be subject to disqualification. RELAY EXCHANGE: All relay exchanges will take place in the transition area where the your bike is racked. Chip MUST be transferred ankle to ankle between each team member. Teams in violation will be subject to disqualification. SWIM: 0.6 Mile out and back swim starting from water at Arnolds Park Amusement Park. Please mark arms and legs with participant numbers using a black marker. Chip MUST be on ankle using a velcro strap during all phases of the event. There will be multiple wave water starts. TRANSITION ONE (T1) - SWIM TO BIKE: Bikes must be racked in the transition area. Enter the transition area from the beach after the swim. Swim time will end when crossing mat after swim. T1 starts when crossing SWIM IN mat after swim and T1 ends when crossing BIKE OUT mat with bike. Run bike over the timing mats prior to mounting your bike. You are not allowed to ride your bike in the transition area. TRANSITION TWO (T2) - BIKE TO RUN: Bike time ends and T2 time begins when crossing BIKE IN mat. Dismount bike prior to entering the transition area and run your bike to your individual area. Place participant number (Race BIB) on front of shirt or put on race number belt. You must have your race bib on, facing forward, during the run. RUN: 4.5 Mile run from transition area out and back to the finish at State Pier in Arnold's Park Amusement Park. T2 time ends and Run time begins when crossing Run Out timing mats. When finishing make sure the back up timers see your BIB number when crossing the finish line. Return your chip/strap at the end of the finish chute. TEAMS: Team comprised of Men, Women or Co-Ed all scored together no separate awards. EARLY START: All participants that have an estimated finish time of 5 hrs or more must specify early start during registration. Early start will be at 5:30AM same location. ANYONE DOING THE EARLY START MUST CHECK IN WITH ALLSPORTCENTRAL STAFF AT START LINE PRIOR TO BEGINNING.